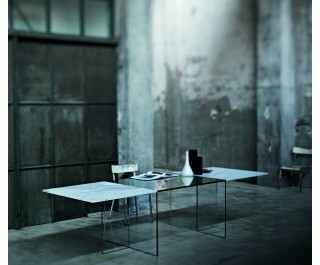 Tables in marble Carrara Statuario Grey Veined and transparent extralight glass mm. 19 thick. The glass top is obtained by gluing the 45° chamfered edges of a central glass slab to the edges of two side marbles slabs. The bases, fixed to the glass top through steel plates, are made up of two glass slabs glued together.